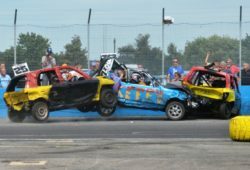 A BRAND new motorsport event aimed at drivers and spectators of oval racing, autograss, speedway and other grass roots motorsport, will debut at the venue next year. The East of England Arena and Events Centre has been chosen to host the event – which will comprise a full-size exhibition across two halls, a live stage, and demonstration races around the oval track – on 16/17 February 2019. The East of England Arena and Events Centre (EEAEC), is a large, multi-purpose venue with a total of 9000m² of indoor event space divided between the main Arena, the Atrium and four fully-equipped event suites. The main Arena offers 4645m² of event space, state-of-the-art heating, ventilation and lighting, and is perfect for exhibitions and trade fairs, large scale conferences, concerts and music events. The outdoor event area totals more than 100 hectares, and features a 1,800 capacity grandstand, parking for 22,000 cars and capacity for 100,000 visitors making it ideal for outdoor festivals, concerts, sporting events, agricultural shows.